The principal reason of banks chartered by the government and the central bank is to make loans to their customers. Banks are expected to support their communities with an adequate supply of credit for all legitimate business and consumer financial needs and to price that credit reasonably in line with competitively determined interest rates. Indeed, making loans is the principal economic function of banks to fund consumption and investment spending by businesses, individuals, and units of government. How well a bank performs its function has a great deal to do with the economic health of fits region, because banking performance support the growth of new businesses and jobs within the banks trade territory and promote economic vitality. Moreover, bank loans often seem to convey positive information to the marketplace about a borrower’s credit quality, enabling a borrower to obtain more and perhaps somewhat cheaper funds from other sources. The internship report is a partial requirement for the Bachelor of Business Administration. As a part of internship program, I was placed at Narayanganj Branch of IFIC Bank Limited. During the three month internship I have learned a lot about commercial banking operation of the organization. This report not only explores IFIC Bank’s activities as one of the leading non-government companies, but also highlights the role of IFIC Bank in the financial sector of Bangladesh. This report contains information about all commercial activities that the bank is dealings with. I have discussed with banking activities general Banking. General banking operation includes all the general activities performed by the bank. The part one covers the following tropic in a systematic manner. Then I have discussed about the types of account holder and different type of account such as-Saving Account, Current Account, and Fixed Deposit Rate (FDR), Pension Saving Scheme (PSS) etc. The activities performed in cash department and the basic matter to be look after. Remittance collection and bill payment procedure section covers the pay order, TT, and DD, clearing of cheque, IDBC, IDBR. I have discussed about the account section where the maintenance of transfer book, cash vouchers, and different types of register book. Bank is a commercial or state institution that provides financial services, including issuing money in various forms, receiving deposits of money, lending money and processing transactions. A commercial bank accepts deposits from customers and in turn makes loans based on those deposits. Some banks (called Banks of issue) issue banknotes as legal tender. Many banks offer ancillary financial services to make additional profit; for example, most banks also rent safe deposit boxes in their branches. Currently in most jurisdictions commercial banks are regulated and require permission to operate. Operational authority is granted by bank regulatory authorities who provide rights to conduct the most fundamental banking services such as accepting deposits and making loans. A commercial bank is usually defined as an institution that both accepts deposits and makes loans; there are also financial institutions that provide selected banking services without meeting the legal definition of a bank. Banks have influenced economies and politics for centuries. The primary purpose of a bank was to provide loans to trading companies. Banks provide funds to allow businesses to purchase inventory, and collected those funds back with interest when the goods were sold. For centuries, the banking industry only dealt with businesses, not consumers. Commercial lending today is a very intense activity, with banks carefully analyzing the financial condition of its business clients to determine the level of risk in each loan transaction. Banking services have expanded to include services directed at individuals and risks in these much smaller transactions are pooled. A bank generates a profit from the differential between what level of interest it pays for deposits and other sources of funds, and what level of interest it charges in its lending activities. This difference is referred to as the spread between the cost of funds and the loan interest rate. Historically, profitability from lending activities has been cyclic and dependent on the needs and strengths of loan customers. In recent history, investors have demanded a more stable revenue stream and banks have therefore placed more emphasis on transaction fees, primarily loan fees but also including service charges on array of deposit activities and ancillary services (international banking, foreign exchange, insurance, investments, wire transfers, etc.). However, lending activities still provide the bulk of a commercial bank’s income. Any institution offering deposit (a sum of money paid by a buyer as part of the sale price of something in order to reserve it) subject to withdrawal on demand and making portfolios (diversify the fund to reduce the risk) of loan is known as bank. The bank is the life blood of modern economy. Modern banks play an important part in promoting economic developing of a country. Banks provide necessary funds for executing various programs underway in the process of economic development. A Commercial institution licensed as a taker of deposits. Banks are concerned mainly with making and receiving payments on behalf of their customers, accepting deposits, and making short-term loans to private individuals, companies, and other organizations. In the UK, the banking system comprises the Bank of England (the central bank), the commercial banks, merchant banks, branches of foreign and Commonwealth banks, the National Savings Banks, and the National Girobank. The first (1990) building society to become a bank in the UK was the Abbey National, after its public flotation; many other building societies have now followed this precedent. In other countries banks are also usually supervised by a government-controlled central bank. We the students of Bachelor of Business Administration (BBA) study the subject’s related to business. The school of business at home and abroad to familiarize each student as they move comfortably in the business environment but only the theoretical study in the class room is not enough rather a practical experience and the only means of practical experience is internship program. In the business environment at home and abroad there is lots of financial institution. Business firms and industries that provide this facility towards us. If we could not get this facility of internship then a wide gaps will take place between our study and experience, I think this is a valuable for us. We the students of business do this usually for three months. In our country there are many banks particularly the esteemed private sector banks, and elite business firms provide this. In this respect I have done my internship at IFIC Bank Ltd. the one of the most renowned private bank in Bangladesh. I am thankful to for this. The internship program is required for the student of BBA. It is a program with duration of three months. Students who have completed all the required courses are eligible for this program. In the internship program I was attached to the IFIC Bank Limited, Narayanganj Branch for three months. During this period I have learned how the organization works. This report helps me to understand the clear real-time experience about the total management of IFIC Bank Ltd. It helps me to understand, how the bank manage its total process? It also helps me to understand how they deal with the customer. This report has been prepared on the basis of experience gathered during the period of internship from (May 06, 2010 to August 06, 2010). For preparing this report, I have undergone group discussion, collected data and sent some questionnaires to the selected Officers and interviewed with some of them. I also studied different circulars and files of the bank. I hope these criteria will be enough to find out different picture of financial performance of the selected bank (IFIC Bank). The nature of the report is analytical in nature. Collecting primary and secondary data regarding practical orientation in banking activities. I have found the strengths and weakness and based on those I have made some recommendations. I have collected primary and secondary data for my research paper. So this report is based on both primary and secondary data. Face to face communication with employees of the IFIC Bank Ltd. In the very beginning of this report a brief description of IFIC Bank has been furnished. Then in the subsequent chapters, elaboration of the two departments of the branch, say general banking, and Loans & Advance has been presented. At last few pages of the main report, some problems in banking which are observed while doing work in the branch are detected along with some recommendations to overcome these problems. At the end of this report appendices and bibliography are added. One of the major limitations is the shortage of internship period. Since three month is not enough to know everything of a Bank, so this report does not contain all the area of IFIC Bank Ltd.
Because of the limitations of various sources of information the report doesn’t contain many important information and data. All scheduled commercial bank regulated by the instruction do central bank. Most of the instructions are confidential to the commercial bank. So, I was incapable to provide valuable information. The main constraints of the study are inadequate access to information, which has hampered the scope of analysis required for the study. Due to time limitation; many of the aspects could not be discussed in the present. IFIC Bank Ltd. is one of those banks that plays important role in the economy of Bangladesh. There are Eighty three branches of IFIC Bank in our country. The activities of the branches are more or less same but there are some differences as per the size of the branches. As I was placed to Narayanganj Branch of IFIC Bank as an intern, my focus of the report will be basically on the functions of Narayanganj branch only. The format of the report is being followed as per the guideline given by the Stamford University authority. International Finance Investment and Commerce Bank Limited (IFIC Bank) is a banking company incorporated in the People’s Republic of Bangladesh with limited liability. It was set up at the instance of the Government in 1976 as a joint venture between the Government of Bangladesh and sponsors in the private sector with the objective of working as a finance company within the country and setting up joint venture banks/financial institutions abroad. The Government held 49 per cent shares and the rest 51 per cent were held by the sponsors and general public. In 1983 when the Government allowed banks in the private sector, IFIC was converted into a full-fledged commercial bank. Our Mission is to provide service to our clients with the help of a skilled and dedicated workforce whose creative talents, innovative actions and competitive edge make our position unique in giving quality service to all institutions and individuals that we care for. We are committed to the welfare and economic prosperity of the people and the community, for we drive from them our inspiration and drive for onward progress to prosperity. Previously IFIC Bank Ltd was Government owned bank. Now the government of the Peoples Republic of Bangladesh holds 34.34 % of shares of the bank. Leading industrialists of the country own 34% of the shares and the rest of the 31.66 % is held by the general public. The founder of IFIC Bank Ltd was Jahurul Islam of Islam Group of Industries. He was the first Chairman and A.S. F. Rahman was first Vice Chairman. Board of Directors of the Bank is a unique combination of both private and Government sector experience. Currently it consists of 13 Director. Of them eight represent the sponsors and general public and four officials in the rank and status of Additional Secretary/Joint Secretary represent the Government. Unlike other banks in the private sector, Board of Directors of the bank is a unique combination of both private and Govt. sector experience. Currently it consists of 23 Directors. Of them five represent the sponsors and general public and four senior officials in the rank and status of joint Secretary/ Additional Secretary represent the Govt. Managing Director is the ex-officio Director of the Board. To form, establish and organize any bank, company, institution or organization, singly and/or in joint-collaboration for partnership with any individual, company, financial institution, bank, organization, or any Government and/or Government agency for- the purpose of carrying on banking, financial, investment and trust business and/or any other business as provided hereafter. To carry on any business relating to Wage Earner’s Scheme as may be allowed by Bangladesh Bank from time to time including maintaining of Foreign Currency Accounts and any other matter related thereto. To contract or negotiate all kinds of loan, and or assistance, private or public, from any source, local or foreign, and to take all such steps as may be required to complete such deals. IFIC Bank Limited mainly follows top down approach to take necessary decisions for the company. Basically they follow the centralize strategy where the Head Office of the Bank control and monitor all the activities of its branches. In case of marketing strategy they basically depend on ‘word of mouth’ as they are already well reputed for its long-term service in the banking industry. IFIC bank has been consistently maintaining the ‘Capital Adequacy Ratio’, as prescribed by Bangladesh Bank. This has been made possible by a policy of building up both capital and reserves. It started with an Authorized and Paid up capital of Tk.100 crore and Tk.63.20 crore respectively in 1983. Authorized and paid up capital increased to Tk.500 crore and Tk.134.66 crore respectively in 31.12.2010. With the active support and guidance from the Government, Central Bank, clients and patrons, the Bank has been maintaining sound financial strength and showing a steady and impressive business performance. IFIC Bank is one of the few mentionable banks which maintains Capital Adequacy ratio and has more than required provision as per Bangladesh Bank criteria. Starting with a modest deposit of only Tk.863.40 million in 1983, the Bank had closed its business with a deposit of Tk.35000.08 million as of 31st December, 2008. Total credit stood at Tk.30000.66 million as on 31.12.2008 against Tk.21, 694.90 million last year. Bank has posted an operating profit (un-audited) of Tk.366940986 during the year ended 31st December, 2008.
Credit policy of the Bank works within the framework of three main objectives, namely, maintenance and improvement of quality of assets, recovery on time and building-up of an efficient customer oriented credit delivery system. The portfolio includes working capital financing, project financing, import-export financing and domestic trade financing etc. The Bank continued to extend working capital facilities to customers to ensure smooth and uninterrupted operation of their business. At the same time, it expanded project financing portfolio to meet the growing demands of the economy for long term financing in a depressed capital market. Project Loans are extended for setting up of new projects and BMRE of the existing Projects as well. Due emphasis was given to financing export oriented and export linked industries without loosing sight of the need for long term loans by other domestic market based industries and ventures. The Bank has financed 34 projects during the year 2009 amounting to Tk.2529.45 million. In long term portfolio, the bank has been diversifying from textile and RMG industries to steel industries, CNG filling stations, Power Sector, Pharmaceuticals Sector, Telecom industries, Chemical project etc. The Bank also participates in syndicate financing. During the year 2009 the Bank sanctioned syndicated term loan of Tk.1175.09 million and successfully arranged a syndicated term loan facility of Tk.565.04 million as the Lead Arranger. Automobiles like bus, luxury bus, minibus, truck, car, pickup, water transport etc. As of December 31, 2008, loans amounting to Tk.786.96 million have been sanctioned under lease finance scheme. In terms of Bangladesh Bank Circular, the Board of Directors in its 633rd Emergency meeting held on 17th December, 2009 approved Prudential Regulations on Small Enterprise Financing and Consumer Financing. Accordingly, the schemes were made operative on 2nd March, 2008. In order to cope with the ever changing market situation, both the schemes introduced various products. In consumer financing, products like, Consumer Durables Loans, Parua, Thikana, Flexi Loan, Peshajeebi Loan, Auto Loan, Festival Loan etc. have been launched to cater to the needs of the people of different segments of the society. The bank has received a spectacular response from the customers in the sector. Total outstanding of consumer loan stands at Tk.5280.80 million as 30.12.2009 which indicates full support and confidence of the clientele. The bank is in the process of launching Credit Card to expand the retail portfolio. As approved by the Visa Asia-Pacific. Board of Directors, IFIC Bank has got Principal Membership of Visa and Plus program. Now IFIC Bank is allowed to issue Visa Cards and can set-up electronic and acceptance machine and ATMs in various merchant locations wherein both the IFIC Bank Visa Cards and other Banks’ Visa Cards can be used. The forma operation of Credit Card has already been started. The bank covers by its activities all the important trading and commercial centers of the country. As on June 01, 2010 it had 82 branches and five SME services centers within Bangladesh. All the branches are equipped with computers in addition to modern facilities, logistics and professionally competent manpower. The branches of the Bank cover all tile important trading and commercial centers in Bangladesh. At present it has 82 branches within Bangladesh. All the branches are equipped with computers in addition to modern facilities, logistics and professionally competent manpower. Steps are underway to open new branches in important locations in the country during June 2010. Computerized Branches: 82 out of 82(i.e. 100%) Branches are computerized throughout the country. Local Area Network: All Branches (i.e. Motijheel, Federation, Dhanmondi, Gulshan, Moulvi Bazar, Narayanganj & Agrabad) are operating in Local Area Network environment. Banking Software: Currently 64 LAN Branches are using BexiBank 4000+ and rests of the Branches are not online system. Central Backup System: Presently Information Technology & Computer Division of Head Office is maintaining an Office Central Backup System for all the Computerized Branches and Division of Head Office of our Bank. Tele Banking (Computerized Phone Banking): Our Banking has implemented Computerized Phone Banking technology in 82 Branches (i.e. Motijheel, Federation, Dhanmondi & Gulshan). Electronic Mail: 82 Branches has (i.e. Motijheel, Federation, Gulshan, Dhanmondi, Narayanganj & Agrabad) are using Email facility for international and internal correspondence. In future all AD Branches will be brought under Email facility. Inter Branch Connectivity: Our major plan in the IT sector is to ensure Inter Branch Connectivity of selected major Branches (i.e. Motijheel, Federation, Dhanmondi, Gulshan, Moulvi Bazar, Narayanganj & Agrabad) under Wide Area Nerwork (WAN) facility to offer our customers “Any Branch Banking” facility. Visa Card: Visa Card already established. Metropolitan Area Nerwork/Head Office Computerization: Network implementation among Divisions (i.e. Special Project Division, Credit Division etc.) of Head Office is in under consideration. D. At present now, all the branches are uses MISYS software system. This software system bring from the USA. The CEO and Managing Director is assisted by a Senior Management Group consisting of Deputy Managing Director and Head of Divisions who supervise operation of various Divisions centrally and co-ordinates operation of branches. The Academy has a good collection of books, journals and magazines. The books are mainly on subjects like Banking, Economics, Accounting, Management and Marketing etc. As on December 31, 2009 the library had 6,861 books/titles. The books are issued to the employees usually for one month. Main training activities consist of in-depth foundation programmers for entry level Management Trainees. Specialized training programmers in the areas like general banking, advance, foreign exchange, marketing and accounts etc. are also organized by the Academy depending on need. Frequently outreach programmers are organized to meet demand for new and specialized skills. During its 26 years of existence, Academy not only conducted courses, workshops and seminars as required by the Bank, but it also organized training programmers for the Bank of Maldives, Nepal Bangladesh Bank Limited and Oman International Exchange LLC. In addition, Academy has also the credit of organizing system of Bank of Maldives. Rolls Royce, Ferrari or a Cadillac that’s for one born with good luck. For the one’s who dream to make their own luck? Come to IFIC for your desired Car. We will make it come true whether it’s a Maruti or a Mercedes. Getting the Loan: / How can you get the Loan? If you are an adult employed person and have an account with us then you can easily apply for the AUTO LOAN. Loan Size: / How much Loan can you get? Loan Period: / What is the period to repay your Loan? Life is complex as it is. IFIC makes your life-style easy and comfortable with the Consumer Durable Loan. So avail the easy facility offer. If you are an adult and employed person and have an account with IFIC, then you are eligible to apply for the loan. Loan Size: / How much Loan you can get? No limits for personal needs, needs are endless. Our EASY LOAN is to serve your personal financial needs. Just walk-in to any of IFIC’s branch and avail your EASY LOAN. If you are an adult person and have an account with us then you can easily apply for the EASY LOAN. A good education is the foundation for a successful life. IFIC is offering the opportunity to students to pursue higher education opportunity with the loan facility. If you are an adult employed person and have an account with IFIC, then you are eligible to apply for the loan. The demands and uncertainties of life getting you down. Here is the answer. Come avail yourself IFIC’s Flexi Loan, to turn the uncertainties of life to a certainty you can control. If you are an adult Bangladeshi employed by the Govt/Autonomous body/ Bank/ MNC/ NGO or any other kind of employed person with at least monthly Tk. 10,000 salary then you are eligible for the Flexi Loan. a. Marriage expense for sons and daughters. b. Holiday expenses for self and family members. d. CNG conversion for car. A man’s home is just not his castle, it’s more than an asset, and it’s an investment for his future generation. IFIC’s Thikana Loan helping you find you’re ADDRESS. Your life’s Satisfaction First. For those people running a successful business from rented premises, IFIC BANK is there to finance you for POSSESSION LOAN. So your business can have its own Permanent Address. If you are a Bangladeshi entrepreneur with only 2 years of successful business record & having a valid trade license and also have an account with IFIC, then you are eligible to apply for this loan. Maximum 65 years on the date of maturity of the loan. Whether you are a Doctor/ Engineer/ IT professional/ Management Consultant or any other professional come find out about IFIC’s advancement Peshajeebi Loan that lays the foundation for your career elevation. IFIC works for your professional Satisfaction. If you are an adult employed person and have an account with us then you can easily apply for the PESHAJEEBI LOAN. To the small entrepreneurs who know their trade yet feel frustrated by the lack of money to get a bigger share in the marketplace. IFIC BANK understands their problem and believes that financial support at the right time can take them to (their desired) right place. If you are a Bangladeshi entrepreneur with min of 2 years of successful business record, have a valid trade license and have an account with IFIC, then you are eligible to apply for this loan. Empower yourself for a secure and prosperous future with IFIC PSS. Partnership for a prosperous and secure future. Under this Scheme you can open a deposit scheme for Tk.500, Tk.1000, Tk.2000 and Tk.5000 and 50000 per month for 3 or 5 years whichever suits you. You can make the deposit within 10th of each month (In case of holiday the next working day). You can receive the entire deposit amount with interest at one go or receive a pension on a monthly basis at a desirable amount of your monthly installments. If you fail to deposit monthly installments continuously for 3 consecutive months your account will become automatically inoperative. But, it can be revalidated on the 4th month on receiving all outstanding installments along with a written application. You will be given two (2) opportunities during the 3 years scheme and three (3) opportunities during the 5 years scheme to avail this option. You can pay installments by transferring from your CD/SB account maintained with the concerned branch. Installments may also be paid in advance. You can close the account at any time by a written application*. Monthly installments to PSS will qualify as investments in yearly Income Tax return. The applicant has to be +18 years of age. On failure of 4th consecutive monthly installment the account will be fully closed automatically. b) If the account is closed within one year, only principal amount will be paid. c) If the account is closed after one year, only principal amount along with interest at saving rate/PSS rate (whichever is lower) prevailing on the date of closure of the account will be paid. A wide range of products and services, such as different type of loans are offered by this department. It faces continuous challenge from the local private banks, which mainly specializes in the consumer banking. As a result, it has to develop new products and services to ease the competition on a continuous basis. The approval is mainly based on the risk analysis of the corporate clients done by the Corporate Banking division. Administration, audit and back office operation. Taking care of taxation and financial control of the Bank. Recovery of stuck-up loans is a major concern for the bank. This division helps general credit and project finance divisions to recover the loans and take legal action against those creditors. Some time there is some usual recovery. Recovery from written off loans goes to income account of the bank. The foreign exchange and money market operation of the IFIC Bank is broad. Exotic currencies happen to be one of its specials areas of strength. A 24 hour-service is provided to customers in Bangladesh through the Bank’s network of dealing centers placed in the principal of the world. The Bank’s treasury specializes in offering solutions to who wish to manage interest rate and currency exposures that result from trade, investment and financing activities of other dynamic economies of the region. Banking involves high risk, the presence of effective internal control system, corporate governance, transparency and accountability is vital to ensure smooth operation of the bank. The internal control is the process affected to provide reasonable assurance for the achievement of the objectives of the bank, the reliability of financial reporting and compliance with applicable laws, regulation and internal policies. This division helps the bank accomplish its objectives by bringing a systematic, disciplined approach to evaluate and improve the effectiveness of risk management, control and governance processes. It also assists development of the process for smooth operation of various department and branches, detect major deficiencies in the branches, review the activities and organizational structure of the internal audit function. All the overseas branches are under the control of this division, the regularly communicate with those branches and solve problem of those branches. It basically handles all promotional campaign, branding both consumer and corporate products and services for IFIC bank. It works with the administrative issues and supervise internal work environment. It also encourages its staff to conform to an internal culture of ethical behavior and sensitivities to the culture and religion of the country. They study the market through which they find out which product has demand in current market, plan for new product features and they collect statistical data for future use. Now all the branches were under similar automated platforms with upgraded software applications to offer all the critical banking features. IFIC Web site has been launched for the convenience of the customers, where all the activities and information are constantly being posted and undated. This gives all technical support to all branches and Head Office. 1983 – Setup its first overseas joint venture (Bank of Maldives) on the Republic of Maldives. – Commenced operation as a full-fledged commercial Bank in Bangladesh. 1985 – Set up a joint venture Exchange Company in the Sultanate of Oman. 1994 – Set up its first joint venture in Nepal for banking operation. 1999 – Set up its second joint venture in Nepal for lease financing. 2003 – Bank celebrated its 20th founding anniversary. – Overseas Branches in Pakistan amalgamated with NDLC, to establish a joint venture Bank: NDLC-IFIC Bank Ltd. subsequently renamed as NIB Bank Ltd.
2005– Acquired MIEYS solution for real time on- line banking application. – Visa principal and plus (Issuer and require) program participant member obtained. 2009 – 64 Branches offering Real Time On-line banking faculty. 2010 – All Branches of IFIC Bank is operating under state –of –art world class Real Time On-line banking Solution. Banking is nothing but collecting money from the surplus units and deploying it to the deficit units. In this regard Narayanganj Branch plays an incredibly crucial role, because we know that in this area most of the dwellers came from elite class and country’s major portion of the money is owned by them. In my orientation period, I have observed that IFIC Bank’s major portion of the deposits comes from Narayanganj Branch. 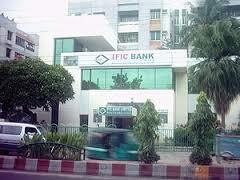 IFIC Bank limited, Narayanganj Branch was opened on 25 November 1983, 66/1 B.B Road, Narayanganj. It’s with an initial deposit of TK 211.08 Lac. 13 officials including 3 authorized officers are posted in the “A” grade branch. Staff strength of the branch is adequate as to the volume of their present business. In comparison with other bank’s branches in this area at Narayanganj mobilization of deposit, procurement of business, assets management of our Narayanganj branch are increasing gradually. In the year 2009, all targets were achieved by the branch except its Advance target. However, all targets as on 30th June, 2009 were achieved by the branch. From the business position as on 13.04.08 (east date of inception), 30.08.09 (date of inception) revealed that credit portfolio of the branch has increasing trend. Total loan & advances of the branch is TK 650.06 Lac as on September 7, 2009 which is 67% of its total deposit indicating very high credit portfolio. The branch earns profit from loan & advances, interest on general account other commission business like commission on L/C, LG, TT, DD, PO etc. Most positive side of this branch is the work environment is very friendly and customers find a comfortable place for their transactions. As given in the organ gram, Narayanganj Branch consists of 13 employees who directly or indirectly serve their customers in various ways. The major functions of the bank have been given before. Now they will be discussed thoroughly by highlighting all the functions of IFIC Bank, Narayanganj branch. Mandate from the partners is essential-indicating who will operate the account. Savings Accounts(SB).Any one expect limited company can open. .In case of withdrawal before maturity the pervious maturity period is considered to pay interest-it is known as Break Down Payment.Short Term Deposit(STD).Generally opened by big business firm. Comments: The number of savings Account is more than Current Account. FDR section provides another service on behalf of the government. These services this bank issues and encash the following govt securities. This section of this branch is also fully computerized. No ledger, no other subsidiary books are maintained separately in this section. All entry is given directly in the computer and then necessary information is printed when required. Sometimes the customer wants to transfer his account to another branch due to various reasons. IFIC Bank, Narayanganj Branch, also gives this kind of facility to the customer. In this case, they will have to submit an application to the branch manager stating the reasons. The officer verifies the signature and finds out the balance of the account holder. The holder also submits the rest check leaves along with the application. Then the officer issues an Inter Branch Credit Advice (IBCA) to that branch and a debit voucher with the balance of deposit in that account. He also sends the account opening form and specimen signature card to that new branch. The new branch officer verifies the customer signature with account opening form supplied to him. The amount mentioned in the (IBCA) considered as the initial deposit of the new branch. The main objective of clearing and remittance department is to provide an extra facility to the customer other than cash receipt and payment. We can divide this department into two parts. One is Clearing & Transfer Delivery section, and the other one is Local Remittance section. In IFIC Bank, Narayanganj Branch, there are three employees, working in this department. I am trying to present my findings in the following parts regarding these two sections. According to the Article 37(2) of Bangladesh Bank Order 1972, the banks, which are the member of the clearinghouse, are called as Scheduled Banks. The scheduled banks clear the cheque drawn upon one another through the clearinghouse. This is an arrangement by the central bank where everyday the representative of the member banks gathers to clear the cheque. Banks for credit of the proceeds to the customer’s accounts accept cheque and other similar instruments. The bank receives many such instruments during the day from account holders. Many of these instruments are drawn payable at other banks. If they were to be presented at he drawer banks to collect the proceeds it would be necessary to employ many messengers for the purpose, Similarly there would be many cheque drawn on this the messengers of other banks would present bank and then at the counter. The whole process of collection and payment would involve considerable labor, delay, risk and expenditure. All the labor, risk, delay and expenditure are substantially reduced by the representative of all the banks meeting at a specified time, for exchanging the instruments and arriving at the net position regarding receipt or payment. The place where the banks meet and settle their dues is called the Clearinghouse. The clearinghouse sits for two times a working day. The members submit the climbable cheque, in the respective desks of the banks and Vice versa. Consequently the debit credit entries are given. At the debit summation and the credit Summation are calculated. Then the banks clear the balance through the cheque of Bangladesh Bank. The dishonored cheque are sorted and returned with return memo named ‘Memorandum’. Bank’s Locker service is also delivered from this department. In IFIC Bank, Narayanganj Branch, this department is maintained by two officers. Step 1 The instruments drawn on IFIC Bank are received from other Banks in the Clearing House by the representing branch of the Bank. Step 2 The amount and number of instruments received are entered in the House Book from the main schedules of respective banks. Step 3 The amount of instruments delivered, received and difference is written in a slip provided in the Clearing House and the Slip is returned. Step 4 The instruments with schedule are arranged branch wise. Step 5 A copy of each schedule is detached. Step 6 The amount of each schedule received is entered in the House pages of the respective branches. Step 7 The respective House pages are totaled and the total of each is noted on a Slip and a grand total is taken out. Step 8 The grand total is agreed with the total of the House Book. Step 9 The instruments are sent to the respective branches with Slip showing total amount and number of instruments. Step 10 The instruments are sent to the branches concerned for clearance along with the IBDA with the total amount of the instruments. Step 11 The House pages along with the duplicate schedules are filed. Step 12 Particulars of the instruments are compared with the schedule and the Slip and the schedules are detached (Receipt of instruments in the Branches). Step 13 The instruments are sent to the respective departments and the schedules are filed. Step 1 The instruments drawn on other banks are received duly entered in the Pay-in-Slip or voucher. Step 2 The instruments are checked and compared with the particulars noted in the Pay-in-Slip and its counter folio. Step 3 In case an Order instrument is being deposited in second payee’s account, guarantee is obtained from the second payee on the reverse of the instruments. Step 4 In case the payee’s name on the specially crossed instrument differs slightly from that of the depositor, the instrument may be accepted but only from the customer’s well known to the Bank and after obtaining an Indemnity this is attached to the Pay-in-Slip. Step 5 Proper stamp(s) is/ are affixed on the instruments and on Pay-in-Slip and the counter folio. Step 6 The instrument is suitably endorsed/ discharged. Step 7 The instrument along with the Pay-in-Slip is sent to the In-charge for checking and signature. Step 8 The instrument and Pay-in-Slip are detached from the counter folio which is handed over to the customer. Step 9 The particulars of the instrument and the voucher are entered in the Outgoing Clearing Register. Step 10 Serial number Is given on each voucher. Step 11 The Register is balanced; the vouchers are separated from the instruments and released after lodgment to the respective departments against acknowledgement in the Register. Step 12 The instruments are arranged bank-branch-wise. Step 13 The Sub-Main-Schedules are prepared in triplicate, two copies of which are attached with the relative instruments. Step 14 The grand total of the schedules is taken and agreed with that of the Register. Step15 The House Page is prepared in duplicate. Step 16 The IFIC General A/C Clearing House representing branch is debited with the amount of the instruments and IBDA is sent to that branch and the party’s account is credited. Step 17 The instruments with the schedules are sent to the branch representing to the Clearing House. Step 18 The instrument is received in the manner similar to that explained in foregoing paras (Receipt of instruments by the Branch representing to the Clearing House). Step 19 The instruments with schedules are received from the branches (Lodgment by the branch representing to Clearing House). For payment of Bills presented to a particular branch of the Bank through another branch of the Bank, the procedures are the same as those applicable to Inward Clearing. The only exception is that there are no clearing house formalities. The concerned branches of the Bank directly deal with Inter-branch clearing. For collecting of Bills by a particular branch of the Bank, drawn on another branch of the Bank the procedures are the same as those applicable to Outward Clearing. The only exception is that there are no clearing house formalities. The concerned branches of the Bank directly deal with Inter-branch clearing. The cash department completes their formalities & then return back the form to the remittance department. When the DD is given to the client, remittance department prepares the necessary advice. i) The applicants have to fill up the relevant part of the prescribed application form duly signed & give it to the officer of the remittance department. ii) The officer fills up the commission & VAT (15% of commission) part meant for the bank use & requests the applicant to deposit the amount by cash / cheque to the cash By that time the authorized officer get the’ Test Number &,also give entry in the TT issue register..
iii) The cash department completes their formalities & then returns back the form to the remittance department. iv) After receiving the form prepare the message conveying form with all details & send the TT after informed the high officials. vi) When the TT message is sent, remittance department prepares the necessary advice. A mail transfer (MT) is the order to pay cash to a third party or for a credit to be passed to the account of the payee in the books of the agent. The order is to be made in writing and sent by mail. Mail transfers may be made by Airmail or Sea Mail, but in ordinary circumstances mail transfer are made by air unless a customer to the contrary makes a request. Then the cheque’s information is written in Token Book and gives a token (metal) to the customer. This section deals with employee’s salary, many types of expenses such as purchase of pen, paper, equipment, machinery and payment of labor cost and employee conveyance. In case of leave of absence employee collects prescribed form this section. This section of the bank is under the second man of this branch. All paper of this section is first signed by the second man of the branch and then branch manager is informed. Section. It receives the vouchers from all departments and prepares the subsidiaries and maintains accounts. End of the day all data are stored in CD and at the month end they are send to Head Office. SWOT analysis is the detailed study of an organization’s exposure and potential in perspective of its strength, weakness, opportunity and threat. This method uses the organization to make their existing line of performance and also foresee the future to improve their performance in comparison to their competitors. By SOWT analysis, an organization can also study their current position, it can also be considered as an important tool for making changes in the strategic management of the organization. All the section of this branch is computerized, without checque collection sector. Hopefully the management decided to provide computer for departments, which will bolster services of the bank. When a joint stock company comes to open an account if the company happens to be an existing one, the banker should demand copies of the balance sheet and profit and loss account, which will reflect the financial growth of the company and its soundness. But in practice companies and the bankers as well don’t even brother. Encoding and decoding process of test number eat up the lion share of the time of the officer who works in that desk. But a simple computer program could do the same if the desk were computerized. Like most of the private bank, IFIC Bank Ltd. also imposes a target deposit for collection upon its employees. Every employee has to go out for the purpose of deposit collection, which they call “development purpose”. It is an effective method no question about it, since many banks of our country relies on this method. But sometime affect negatively and cause job dissatisfaction. Officers of the desk, where workload is very high, hardly get the chance to go out for development purpose and always feel that their duties for the organization would not be evaluated unless they can show a good amount of deposit collection against their name. Narayanganj Branch should extend with their all out effort to increase the credit portfolio and to procure more low cash deposit, increase non funded business so as to minimize dependency on interest earning from IFIC Bank general account and to improve overall business performance of the branch to maintain earning. Narayanganj Branch should set up more CC camera in the branch to hold more control of manager in the branch. It can install CC camera in accounts department and clearing department as it is an important past of the branch and it is not always possible for the manager to visit all departments which has become important. Narayanganj Branch can contact with the existing customers to make the dormant accounts operative. There are numbers of new private banks and some have already activated with their extended customer service pattern in a completely competitive market. Where as IFIC Narayanganj branch is far behind. They are not competitive in customer service because the officers do not behave in professional manner in fort of customer. Some time they are late in there service, which ultimately disturbs the respective customer. Narayanganj branch personnel should train up about all sort of information regarding SWIFT and its service. Due to lack of proper knowledge about the operation procedures and services provided to the customers by SWIFT, certain customers are facing problem, as they have to wait for certain time to get service as there was one officer know about the procedure of SWIFT. He is not fully independent of handling SWIFT. Official training is the solution to this problem. For customer’s convenience in Foreign Exchange Department of IFIC Bank Ltd. should provide more personnel to deliver faster services to their honorable customer. Without proper knowledge in different laws, rules which set by Bangladesh Bank efficiency of employees cannot be optimize. Bank can arrange training program on these subjects and can test its employees which will improve their qualities.IFIC Bank Ltd. should focus on their promotional activities. They should also focus on the marketing aspects to let customers know about their products and offerings and more promotion is should be given to attract new customer. From the learning and experience point of view I can say that I really enjoy my internship at IFIC Bank of Bangladesh Ltd. From the very first day, I was confident that this 3 months internship program at IFIC Bank Ltd. of Bangladesh will definitely help me to realize my future carrier in the job market. Performance analysis of a department of a bank is not so sufficient to measure and express perfectly within this short time of my internship period. But it is a great opportunity for me to get use to with the operational environment of commercial banking of IFIC Bank. I have tried by soul to incorporate the research report with necessary relevant information in my report. Few loyal committed customer bases, lack of modern and effective technology or facilities, not enough skilled employees in some sector, considering all of these very important factors, IFIC Bank should always try to improve their service level in every term. The marketing department should think freshly about their marketing objectives and practices. Rapid changes can quickly make yesterday’s winning strategies out of date. As a developing private bank in Bangladesh, IFIC Bank shouldn’t allow their client to get dissatisfied with their service. They have their competitors who actively striving to take the advantages in every side. During the course of my practical orientation, I have tried to learn the practical banking to relate it with my theoretical knowledge, what I have gathered and going to acquire from various courses. H.P. Collin “Dictionary of Banking & finance”(1996) universal book stall. Annual Report of IFIC Bank Ltd. 2008.